360 magnets. 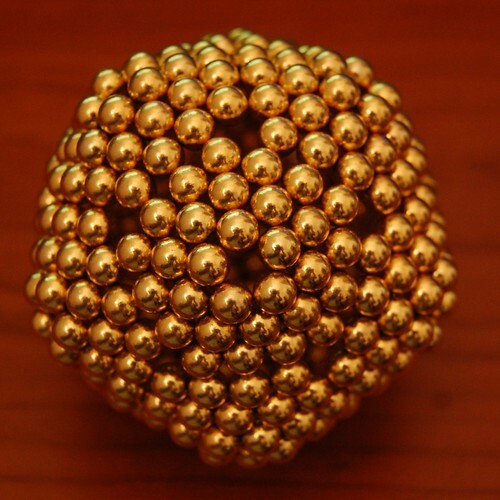 Each 15-magnet pentagon has a 15-magnet pentagonal pyramid mounted on it. 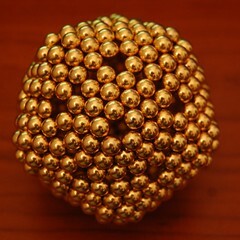 This is the standard 30-magnet pentagon unit. Magnet poles are aligned parallel to the perimeter of each pentagon. Adjacent pentagons have poles aligned in the same direction at the edges (as evidenced by square instead of triangular patterns at the edges). Each pentagon is mounted rotated by one magnet, leaving triangular holes at each vertex.